Looking for a new spring scent? 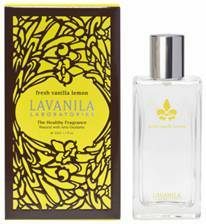 Search no further than Lavanila’s NEW Fresh Vanilla Lemon. Make an airy impression with this modern citrus blend of crisp lemon, fresh bamboo, lush watery fruits and pure Madagascar vanilla – sure to be the brand’s cleanest take on vanilla yet! Unlike traditional fragrances, The Healthy Fragrance in Fresh Vanilla Lemon is beautifully made using pampering, natural ingredients. A breakthrough in natural deodorants that delivers mighty protection against odor. For invigorating confidence, The Healthy Deodorant leaves behind a delicate trail of light citrus and powdery vanilla. Housed in a slim, spill-proof bottle, this tote-able fragrance lets you dab on lemon goodness whenever you need a quick refresher. The perfect perfume pick-me-up!